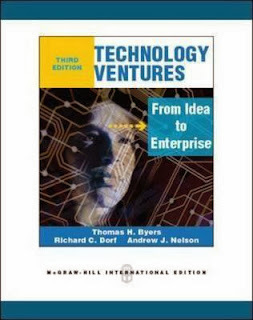 I have recently finished reading the book Technology Ventures – From Idea to Enterprise (Byers, Dorf, Nelson, 2011, 680 pages) and I am definitely happy with it. This book is one of the required readings for a course in Entrepreneurship I am currently following at the University of Oslo, as part of the Master program on Entrepreneurship and Innovation. And I confess I was a bit skeptical when I first saw that it covers all aspects of building up a technology company: how could a single book cover all elements of such long and difficult process, I thought, from idea to intellectual property, from marketing to finance? But, to my surprise, this book does exactly that: covers all aspects and do it surprisingly well! One of the interesting ideas the authors had was to follow a single company creation (real case) that illustrated the topics discussed in each one of the 20 chapters. With such “real-world” focus, including stories on many different existing businesses, the book accomplishes the task of covering theory with a practical bias. And this is very good, especially in an area that is so reality-based. So, I really recommend reading through this book. Of course it should not be the only one to be read, but is a good summary for many other “must-read” books around the covered subjects.